This is Nissan Juke's new model exploding after interacting with the new Kinja. 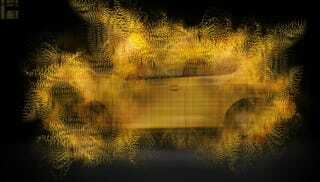 Nissan published the photo saying it is a teaser for the new Juke destined for the Geneva Auto Show. No injuries were reported said Nissan's PR representative. All photographers except one and spot boys were at a safe distance when the Juke was let to use a computer to read Jalopnik's Front Page. The vehicle approached the computer where the website was let open already. Unsuspecting of the changes, Juke innocently came close and hit open a post where the environment was new and the vets moved in to calm the animal. The continuous scrolling supplemented by the inability of findings its own comments, it was moving out of control. At this moment, the investigators interviewing the witnesses said that the Vet ordered everyone back as the temperature gauge began to spike out of control. It would inevitability blow any moment as the crew stepped back. Fearing debris hitting everyone, the building was ordered empty. The photographer who hasn't been identified as of yet remained in the building as officers didn't have time to stay behind for him. Updates to be shared soon as the dust settles.